Over 850 schools in England and Wales were involved in at least one stage of the REsilience / AtGyfnerthu Programme. 112 schools in England and 40 in Wales participated in the full project, including contact with a mentor who visited and supported the RE department. 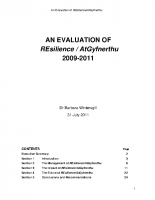 The REsilience project evaluation report was written by Dr Barbara Wintersgill in July 2011.